We apply the same philosophy to specifying your boat as we do to providing our service – “Only the best will do”. As you would expect, Carefree Cruising’s market leading luxurious shared ownership narrow boats are stylish, very well built and have a very high equipment specification. All our boats are built by our sister company Elton Moss Boatbuilders, who are renowned for the quality and reliability that is built into their boats as standard. Your boat comes fully equipped with everything you will need from a full set of crockery and kitchen equipment to a full set of duvets and pillows. We don’t use ‘themed’ names or corporate livery. 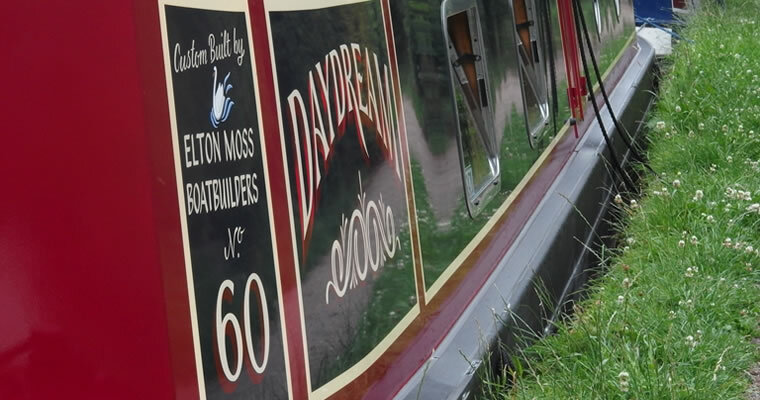 The paint scheme and name of your boat is chosen by you – so down the cut or down the pub, everyone will know your boat is top quality and privately owned – by you! When you buy your share in a Carefree Cruising boat, we take care of everything. We build your boat and your syndicate of co-owners with equal care. When you purchase your share, you are purchasing the right to have this number of weeks for your canal holidays on your boat each and every year for life! Each year, you will pay a proportion of the running costs of the boat. This will be the same proportion as your share. For example, if you own a 1/12th share, you will pay 1/12th of the running costs of the boat. You also pay (direct to the Marina) the costs of the diesel that you use, plus the cost of having the toilet tank pumped out. There is also an optional valet service available at each of our bases for owners who wish to make use of it. Our syndicate budgets cover all running costs associated with the boat including a budget for winter maintenance work, realistic budgets for the cost of repairs and servicing, our management fee, which is very competitive, and a future repairs fund. This fund ensures that the syndicate has funds in place in advance for ad hoc costs such as a repaint or engine work. By covering all of the boats running costs in a single budget, owners are fully aware of all costs in advance, and can relax knowing that there will be no unexpected bills. BEWARE of other schemes that say they are inclusive as often the winter maintenance work is not included and will be charged as a extra – often giving a very unexpected bill at the end! Below is copy of the syndicate budget for our 2018 boat Skylark. Please note: The running cost for a new boat are lower than on existing syndicates as there is less repair and renewal expenditure in the early years of service. We make sure you’re involved at all times and provide all the legal proof of ownership, co-owners’ agreements, usage schedules, boat license and moorings… and on board you’ll find binoculars, books, charts…the complete Carefree package. We have had some fabulous weeks and memories on Water Lily, thanks for managing the syndicate so professionally.